Virginia Storm Chasing | Yes, there are severe storms in the Old Dominion! For grins and giggles I looked up rotation tracks associated with the storms I chased yesterday. Here’s what I found. Obviously I was paralleling a weakening mesocyclone. It never regained the strength that it had when it produced the tornado. Now for storm #2 which my son and I intercepted east of Rocky Mount parked just off VA Route 40 looking southwest. Here’s the 1 hour rotation view (left) with our location at the blue star and a photo of the updraft (right). Even though the radar reflectivity signature resembled a hook echo the rotation was weak and didn’t tighten up. And just for reminders here is an image taken at 4:30 p.m. looking directly west at the southern circulation. I have a confession to make: I don’t look forward to chase days like today. Low ceilings, lots of rain, rapid storm speeds (50+ mph), and messy line segments that morph into “rainy blobs” all translate into spending lots of time zooming around in the chasemobile and not much time outside ,watching convection. Throw in our family’s “Moderate Risk curse” (we’ve had very little luck under the big “M”) and today had all the ingredients of a trying and difficult chase. Having said all that I did obtain a measure of enjoyment today DESPITE the early start. Given the dynamics and timing derived from short range models I was prepared to head down the driveway before noon…but then I peeked at the radar at 9:45ish this morning. A cell southwest of Martinsville was already exhibiting a strong rotation couplet and tracking northward so I hurriedly finished my chase preps and departed. With both the storm motion and the polygon “leaning” to the east I decided that I needed to retreat in that direction. Unfortunately the lack of a helpful road network in that part of Franklin county coupled with the forward speed of the storm put me too far away when it screamed past my latitude. I quickly doubled back west on VA Route 40 to Glade Hill where I turned north on a rural road in an attempt to catch back up. During that stop the inflow winds were ferocious, pushing me around while I snapped the picture. This was my location on the radar with respect to the storm: I wound up traveling north of the Smith Mountain Lake area in a vain attempt to (a) find a vantage point to watch from and (b) catch back up with the business end. I finally called off the pursuit and reversed course to intercept more storms that were pressing northward. By this time my son was out chasing and joined me at Glade Hill where we temporarily dropped a vehicle to chase together for a bit. Storm #2 was moving in our direction so we stopped to watch as this storm, showing broad rotation and a hook-like feature on radar, took aim at Rocky Mount. Given a break in the action we rolled onward to Rocky Mount for lunch where we listened to the locals talk about the tornado that had ravaged areas not far south of town. Photos and videos were all over social media so I had to chalk up another missed opportunity. Jumping back onto Rte 29 northward we diverted onto back roads east of Chatham to try and gain position on this accelerating storm. Falling further behind it we wound up pulling back onto Rte 29 to use the highway speeds to try to catch back up. We didn’t have much success. Thus at our final stop in rural Pittsylvania county near the village of Hurt we waved bye-bye to this storm as zoomed away. Overall today was a decent chase day despite my misgivings. I can’t complain about that! #vawx Could this be February 2016 deja vu all over again? Having pored over a couple different runs of several models the overall consensus is that early showers and possibly strong storms across the I-85/I-95 corridor could put a damper on afternoon destabilization in that region. Meanwhile the area west of the I-85 corridor will see scattered convection during early afternoon that could tap into the available shear and provide some discrete rotating updrafts. These cells will be zooming north-northeast at 45-50 mph so “chasing” may be limited to “watch them scream by”. Then a strong and wet squall line looks to intensify along a boundary and charge northeast. Timing of this activity varies a bit between models but it looks like a mid- to late afternoon event for the western piedmont with storms reaching the I-95 corridor just before sunset. Strong straight line winds accompanied by embedded supercells will very likely foster wind damage and localized flooding. A few tornadoes are certainly possible especially along breaks in the line. This looks a bit like the February 2016 severe weather outbreak in which the NAM was more accurate with its “look at me, look at me! !” outlook than other models. Thus, after hunting for discrete cells ahead of the squall line my chase philosophy will be similar to that 2016 event: pick a west-to-east route and stay ahead of the line while watching individual cells zoom along it. My initial target is still up in the air (pun intended) but I usually don’t nail that down until the morning of…e.g. tomorrow. The GFS has a low level inversion across that area possibly due to earlier rain that would tamp down the instability. The shear looks robust enough but there may not be enough directional shear for mesocyclone development. We’ll see. More to follow in Wednesday evening’s online Hangout at 8 pm. Join us! As it turned out I was able to squeeze in a short limited range chase today. After all how could I let a Palm Sunday setup go unchased given all the past outbreaks on this particular Sunday? I hurriedly threw my gear in the chasemobile and rolled down the driveway just before 1:30 pm to intercept the “Tail-End Charlie” cell of a rapidly moving line segment headed northeastward through Franklin county. It had been tornado-warned for well over an hour by the time I got on the road. I planned my intercept to be near Bedford on U.S. Route 460 as this storm zoomed in that direction. Dodging through Sunday afternoon traffic I kept an eye on the forward progress of the cell via radar as ceilings were fairly low which limited MK 1 eyeball visibility. I basically core-punched it as I scooted east on Rte 460 around the town of Bedford after I determined the risk of encountering hail or a tornadic circulation was basically nil. Driving through heavy rain I pushed east of town onto dry roads as the storm rushed northeast. Slow rotation was visually evident at the eastern edge of what looks like an RFD cut in this photo and a sped up video clip corroborates that rotation. With this cell pushing into mountainous – i.e. unchaseable – territory I bade farewell to it and motored back toward Bedford. 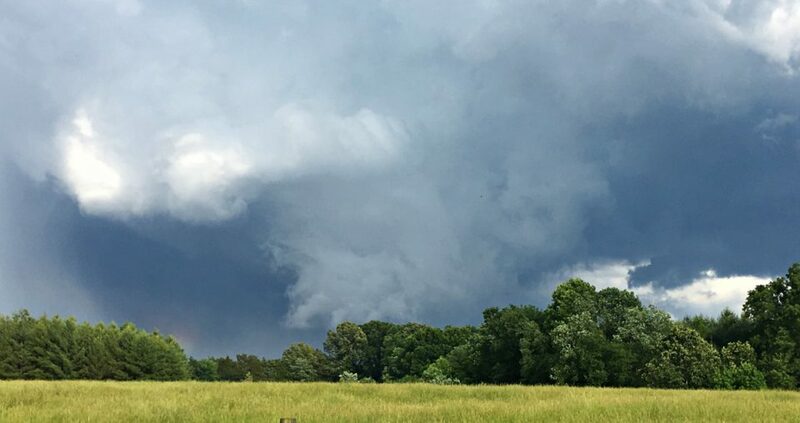 A line of showers and storms had formed along and atop the Blue Ridge mountains with yet another tornado warning on the southern end of a line segment coming out of North Carolina. (This was to be the pattern for the afternoon and evening hours, pointing to a probable warm front perched along the eastern slopes of the Blue Ridge.) I repositioned south of Bedford at a rural vantage point in hopes of more storms firing ahead of the line but such was not to be. I finally pulled up stakes and dropped south past the Smith Mountain Lake vicinity and onward to Rocky Mount. All I encountered was more heavy rain so, running out of time, I called it a chase and rolled homeward. It was more than I’d expected to be able to accomplish today with respect to chasing so I was satisfied. Those values are very high for the Mid-Atlantic. The only problem is the time, which for this map is 02Z or 10 p.m. EDT. Chasing rotating storms after dark here in Virginia is NOT something I will voluntarily do nor would I recommend it to others. Even though two separate areas of convection look to cross Virginia things just don’t look like they’ll go ballistic here until dark. Several other short range models seem to agree with this timing. Thus even though I can’t chase tomorrow the window for chaseable storms (by my definition) may be very limited. We’ll have to see. It’s very unusual to see any forecast probability of severe weather here in Virginia this far ahead of time. Thus the end of next week may well feature (a) another Hangout to discuss the details and (b) another chance to chase a volatile April setup. Stay tuned! It’s the most convective weekend of the spring so far and it looks like (a) the timing and location of storms won’t be ideal for me to chase and (b) I have other plans/responsibilities this weekend. Of course. Northwestern Virginia, including the Shenandoah valley, presents an interesting setup for this evening. CAPE values, shear vectors, moisture indices, and an approaching front all point to a strong squall line (sorry, QLCS) that will be approaching the WV/VA state border near sunset. Several short range models are showing shear vectors to be at an acute angle to the QLCS axis at that time and location, meaning breaks in the line are likely. Those breaks are prime spots for brief spinup tornadoes. Unfortunately such action looks like it’ll occur near or after dark meaning that chasing would be dicey and that local residents need to be on their toes listening for weather warnings. Meanwhile Saturday’s setup across eastern Virginia and northeastern NC is associated with the stalling cold front. I’d bet a couple of cells along the I-85/I-95 corridor will be worth checking out. However my chasing availability both today and tomorrow will be very limited. And then there’s Sunday. How about a Day 3 SPC Enhanced Risk to garner attention? The most ballistic action looks to take place across and west of the Appalachians but sufficient energy is available to make life interesting even over the Piedmont of Virginia. Unfortunately, I won’t be available to chase Sunday. All I’ll be able to do is to check out any local storms via a spot/chase near the home front. As a result almost all of the short range models indicate a general weakening of storms as they cross the Appalachians. That Marginal Risk may(?) be extended eastward into northern Virginia on Friday but that remains to be seen. That same cold front will then stall across Virginia on Saturday, providing a focus for both convection and heavy rain. There may be some strong to severe storms across southeastern parts of the Old Dominion (i.e. south of the stalled boundary) due to differential heating and possible sea breeze forcing but at best I’d expect an SPC-generated Marginal Risk covering that part of the state. Given the amount of moisture both already on the ground and in the atmosphere by that time flooding may become a concern. The NWS Blacksburg forecast discussion for Sunday includes a mention of yet another high shear / low CAPE (HSLC) situation which is typically tough to chase due to low ceilings and reduced overall visibility. Flooded rural roads may also be an issue. The discussion does mention the potential for low-topped rotating storms – a characteristic of HSLC setups – with the expectation of either a Marginal or Slight Risk to be issued by the SPC by Sunday. I doubt I’ll be chasing any of these three days due to schedule conflicts. If the setup looked promising enough Friday or Saturday I could rearrange things but that doesn’t look likely. Sunday is a definite no-go for leaving town to give chase. The best I could do would be a local spotting opportunity. Hopefully this progressive pattern will lead to more April chasing opportunities that don’t conflict with personal schedules! Note that the core that passes over Bedford is a right-split of the original cell. Now, take a look at the rotation tracks for a better illustration of the split: The right split wound up being a fairly discrete cell with great (and visible!) structure. Of course this is what I’d hoped we would see further south with updrafts going up ahead of the intersection of frontal convection with that from a southern impulse near the NC/VA state line. Such was not to be as the front seemed to stall further north than originally expected. And even the discrete cell we observed while we zoomed around Danville was very quickly swallowed by the vast precipitation shield of the “blob”. Storm chasing becomes kinda like a multiple choice test once convection fires. Which cell to chase? Most of the time it seems wise to stick with the first choice…and I didn’t yesterday. Oops! After all, most forecast models were pointing to the main activity happening along the U.S. Route 58 corridor with the morning AFD from NWS Blacksburg basically saying the same thing. So we bade goodbye to that cell and motored south to the Blue Ridge airport west of Martinsville. At this point I was a little concerned about the size of the amorphous mass of convection heading northeast across the NC piedmont but I still felt that discrete cells would fire ahead of it. When the rain approached without any clear signs of storm details we left for parts eastward. When the rain approached too close for comfort we retreated further east with the thought of stopping at the NC Visitors’ Center just south of Danville VA to check out the eastern edge of the convection. However as we drove along I saw nothing of interest on the eastern side. Meanwhile the blob’s precipitation shield began expanding quickly enough that it became obvious we weren’t going to reach the Visitors’ Center before the rain did. However this cell was quickly swallowed by the giant amoeba that was now inside a very large severe thunderstorm warning polygon.